Mini has come out with its three variants of the smallest luxury camper in the world- the Mini Clubvan Camper, the Mini Cowley and the Mini Countryman ALL4 Camp which has a unique rooftop tent for the perfect night halt. These luxury campers have the perfect features that can make your ‘mini’ camping trip a sheer delight. The Clubvan Camper is equipped with a sleeping room (just for one person), a small kitchenette along with a propane stove, a TV and a handheld shower. The Mini Cowley, on the other hand has a detachable caravan trailer that is enough for two and is fitted with a shower unit, solar battery charger and a kitchen. The Mini Countryman ALL4 Camp comes with an innovative rooftop tent, which looks very different. These perfect mini campers are the answer to the growing trend as well as demand for camp and festival-goers, who need to pitch in for a short time frame and a camper is the ideal choice for such short trips. These campers are packed with all the accessories that are essential for a short trip. Indeed, the smallest luxury camper van in the world does have all the comforts that would make your trip memorable such as a sleeping berth, a fridge, a kitchenette with a propane stove, a handheld shower, a satnav system for locating remote regions, a high capacity heater and a TV unit. This small caravan is the perfect choice as it also has a sliding glass roof panel, so that you can star gaze at night. The MINI Cowley can accommodate two people and it is barely 12 inches bigger than the MINI Clubvan Camper. If you love going on frequent adventure trips, then the MINI Countryman ALL4 Camp is the one for you with its roof mounted tent along with fixtures for mountain bikes, apart from providing you all the luxuries that you need when you are out of your home. This innovative MINI camper is the perfect getaway vehicle for a couple with unlimited possibilities of adventures and expeditions. 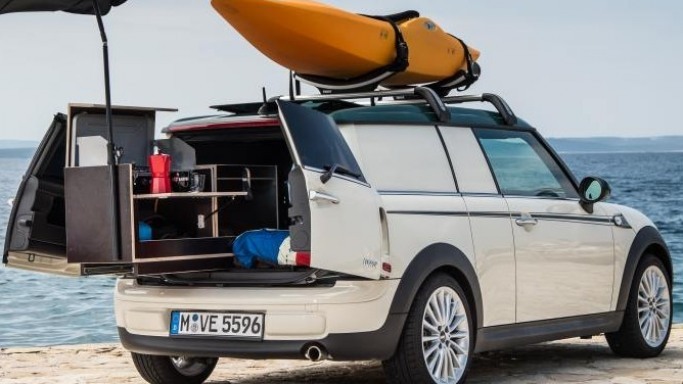 All the three camper models by MINI are designed perfectly and exude a lot of comfort which has made the brand extremely successful across the globe. These vehicles have been built with a view to offer ‘maximum touring pleasure with minimal footprint’ and have also proved that minimal space can be utilized in the most effective manner possible. From warming your chilly winter night to providing you entertainment in the most remote destinations, your MINI camper has it all.